There is definitely something amiss with my view of crime. I read crime mysteries and police procedurals for pleasure, but reading about crime from the other side—innocence and guilt or suspects and law or the possibility that the criminal justice system can be wrong—makes me anxious and fretful. I don’t like crime. It seems like weakness. What I have come to see is that crime can occur on either side of a prosecution or conviction: the accused can be guilty of weakness or legal counsel can be guilty of weakness. Both are crimes, but they are not always pursued with the same diligence. It is this travesty of justice that is so disturbing. My judgment of ‘criminals’ had always been that they made a mistake, sometimes just a little mistake, but they should pay for their crime. If they killed someone, that was a big mistake, and those folks should also pay for their crime. I wasn’t going to worry about the death penalty since they didn’t. The world has too many huge problems to worry about the life of some murderer. One can make a mistake, one just has to pay for it. I trusted the system worked…that if the crime was really manslaughter or had some other mitigating circumstances, that the courts would battle it out. I was more concerned with justice for the victims of crime. In a discussion over the death penalty with family, my mother mentioned that we couldn’t apply the death penalty anymore because sometimes the convictions are wrong. Mistakes are made. 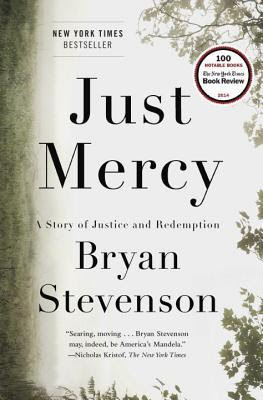 Bryan Stevenson shows us that sometimes it is not mistake, or ‘accident’ that an innocent black man, or child, is chosen to stand guilty for a crime committed. Sometimes it is malice and intentional prejudice that such things happen in the United States, not just in the past, but now. Today. In that case, if mistakes, accidents, or purposeful crimes are committed against the accused, we cannot use a death penalty, morally. End of conversation. This book tells us some of Stevenson’s early cases, some he won, some he lost. Midway through his account of working on wrongful imprisonment cases in the south, Georgia and Alabama, he recounts in detail the release of a inmate on death-row for six years, Walter McMillan, on whose behalf he’d been working for at least two years. We are hungry for the details, how it played out, if McMillan got compensation, if anyone was held responsible for wrongful imprisonment. It’s a story that makes one angry and grateful, all at the same time. Below please find a 30-minute TED talk by Bryan Stevenson that explains some of the things he’s learned since he began working with death-row inmates. This TED talk comes when he is in his early fifties. This book was written in 2014, two years later. He began working with the Southern Center for Human Rights in the summers from Harvard Law School when he was in his early twenties. That’s nearly thirty years working and learning all about wrongdoing on both sides of what we call a crime. Let’s admit something here: Stevenson is an unusual man. He says in that TED talk that he learned that people are more than their crimes. That may be true, but I am not as forgiving as he is. How he got to that safe place in his head begins to sound like Mother Teresa among the lepers…helping those with the least resources among us. It occurs to me that he could not live if he didn’t forgive, with all that he has seen. But he has looked at the criminal justice system as closely as anyone so we have to ask: Can capital punishment ever be fair? What is justice? He makes the point that incarceration has become an industry which can perpetuate racial injustice, and he makes an impassioned case for why we shouldn’t charge juveniles as adults. Justice is hard, like most things worth doing, but we have to try. Ah. So there it is. He makes his point. I agree with all that. If there wouldn’t be another criminal after we’ve addressed all the things we have neglected to do, I wouldn’t be sorry. The oral arguments for the case Evan Miller v Alabama that Stevenson argued and won before the U.S. Supreme Court.